GCA Altium acted as exclusive financial adviser to the shareholders of think project! GmbH, a leading provider of cross-enterprise collaboration and workflow software for the construction and engineering industries, on the sale of the company to TA Associates. This transaction exemplifies GCA Altium's deep domain expertise and significant transaction experience in the software sector. Founded in 2000, think project! offers a SaaS, multi-tenant platform used by more than 100,000 users across over 8,000 projects in 40 countries. think project! delivers a readily available and shapeable common data environment (CDE) for construction and engineering projects. The holistic and highly flexible solution portfolio is based on cutting-edge technology. think project! is BIM-enabled, offers APIs for close integration with other business applications and can be accessed via multiple touchpoints and devices. think project! currently supports asset owners and general contractors across over 20 sectors including the energy and automotive industries, infrastructure and government projects. The company has approximately 200 employees across its Munich headquarters, R&D centers in Berlin and Stettin, and regional sales offices in Spain, Poland, Austria, the Netherlands and France. 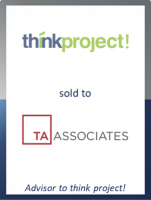 TA Associates, one of the largest and most experienced global growth private equity firms, is investing into think project! alongside its CEO Thomas Bachmaier to support the continued evolution of think project! and to accelerate growth in its core German market and internationally. The transaction was closed in December 2016. Terms of the transaction were not disclosed.